Is the appearance of your smile marred due to missing teeth? Do you find yourself wishing for a complete smile once again but aren’t sure what to do? At Giamberardino Dental Care we can help restore your smile and replace missing teeth with dental implants. Dental implants are a preferred tooth-replacement option because they are a more secure and permanent solution than other methods. For implants, a titanium post will be inserted into your jawbone. 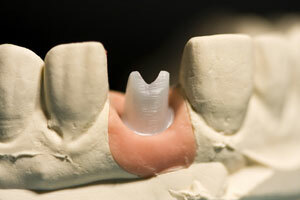 Over time the post and your jawbone will bond, creating a secure base for your implant. This firm base helps to mimic the roots of a natural tooth and ensures that your dental implant will last. The post will be topped with a custom crafted crown to complete your restoration. Another benefit of dental implants is that this method helps to retain more of your jawbone and keep it from deteriorating over time. Once the roots of your teeth are gone, it’s harder to retain your natural bone structure. Also, you won’t have any fit or potential slippage issues like you would with dentures. If you’re missing teeth, dental implants are a great choice to restore your smile and replace missing teeth. If you’re interested in learning more, please give us a call. We want all of our patients to have beautiful, complete smiles.